A new thread for the weekend The Oil Drum Why does driving too much make you poorer? This is the start of a new semester and so it is time to begin the weekend Techie talks again. However this time I am going to try creating the occasional picture, rather than just referring to other sites, in the hope that this might be more useful. Some of these will come from 3-D models that I am building to make the illustrations, so if there are some questions or other views that might help, ask and I may be able to generate a different picture. For the first couple of talks I want to go back and revisit coal mining. Both the Washington Post and the NYT have stories recently about coal mining and the people who work there. I remember once being in a class that was discussing D.H. Lawrence's "Sons and Lovers" and the portrait of mining that it presented. It did not correlate well with my memories of being in a mine, which was often much warmer and drier than it has been described. And so I thought that, today, I would try and create some simple illustrations of some aspects of what coal mining is all about. I am going to do this in two parts, because there are two distinct ways of mining the coal. One is called Room and Pillar, and that is this week, and the other is Longwall and that will be the next topic. Coal has been mined for centuries. It is usually found as a relatively flat layer of soft rock, often under a layer of relatively soft shale, and just above a second layer of shale. These then form the roof and floor of the tunnels, or headings, through which the mine is developed. Because the shale is often softened by water, this can pose longer-term problems. But one can, simply, think of coal as being the layer of cream in the middle of a cake. And one of the tricks is to carve out the cream without the top half of the cake falling on your finger. When mining started men first picked up coal that was washed ashore. Then it was found as layers, or seams, in the sides of hills and dug out for use. But as the seam went further into the hill it became easier to dig small vertical shafts down to the coal, and then dig out the coal around the shaft, loading it into cane baskets or corves. The pits were larger at the bottom than the top and so they became known as bell pits. Initially these were very small, and women and children often carried the coal up the shaft, using ladders. As they got deeper horses were used to pull the baskets to the surface, using a variety of methods. (Sorry, I'm still learning the program to model people and animals so I'm still using other sites for those pictures). But there is a problem. If you keep widening the hole all around, then after a while the rock over the opening will fall in. The only case I know where this happened was where the hole was about 30 ft in radius and about 100 ft deep (and they were mining uranium, but that's another story). To protect against this, the miners would leave a pillar of coal here and there, to hold the roof up. But, as they mined away from the shaft, the air would not easily move around the workings, and since the coal would give off gasses, including methane (natural gas, carbon dioxide and carbon monoxide) this could well be fateful. And so the miners began to run sets of tunnels out into the coal that ran parallel to one another, but with cross tunnels (cross-cuts) between them so that they could circulate air around and up to the working area. At one stage, to power this air circulation, they would light a fire at the bottom of a shaft, and this would draw the air to it, and from the mine. It was given the name furnace draft ventilation. In other cases the shaft was divided, with fresh air going down one side, and the heated return air going up the other. A major accident occurred at New Hartley in Northumberland, UK in 1862 where the main beam for the dewatering pump fell into the shaft, blocking it. The men and boys in the mine, virtually the entire working male population of the village, were all killed, It was a result of those deaths that legislation was passed that required that there be two separate ways to get out of a mine. Where the mine is deep underground this means that there are generally two shafts, or more from the workings to the surface. Initially men broke the coal from the solid with picks. To mine more efficiently they would first swing the pick along the bottom edge of the coal, and cut a slot that would be perhaps a couple of feet deep. Then they would drive the pick into the cracks in the main seam section and break the coal to the edge that they had created. When they worked this efficiently, a man can be very effective in breaking out the coal (about 4 joules/cc specific energy, for those that are interested, The machines mine at around 1,000 joules/cc of coal removed). As the working face grew away from the shaft, it became too slow to rely on women and children to carry the baskets, on their backs, to the shaft and up out of the mine. So first rails were used to carry the baskets. At first these were of wood, but then were changed to metal. Also horses (or pit ponies as they were called) were taken underground and used to haul the baskets. Ponies were used for haulage well into my working career, and leading one was the first underground job I had, when I worked in the mines before going to college. Because a man with a pick is, though efficient, quite slow, machines were developed where a large number of picks were set into a chain, rather like a large chain saw, and this was used to undercut the coal seam about a hundred years ago. Then holes were drilled into the coal above the slot, filled with a stick of dynamite, and the blast would break the coal into pieces, that the miner could load into tubs. Typically he might load some 20 tubs in a shift, and these were hauled out of the working area by one of the lads, who would then attach those from several of the faces, and pull the resulting train to the shaft using a pony. From this came the idea of putting lots of these chains together to form a belt that would grind away coal all across the face, without the need for the explosive. In other words the coal could be won continuously, without stopping to clear the explosive gases, It was found that the picks did not have to be right beside one another but could be spaced, and this was the birth of the modern continuous miner. Here the pick points are spaced around a drum, and this is spun and moved into the coal grinding it away from the solid. (The pictures that follow were generated using Strata 3D and portray, as does this post, a simplified view of the parts of a working section of a relatively modern mine). The picks are normally arranged in a more complex pattern than that shown, and the conveyor starts at the bottom of the drum, rather than the top, but you should be able to understand how it works). The picture shows the continuous miner starting to drive a heading while loading coal into the shuttle car behind it. (I have not shown the power cables or, people). Normally a section may have two or three of these cars, so that while one is carrying the coal from the continuous miner to the main belt conveyor transfer point, the second can replace it and catch the next batch of coal to come from the machine. In the heading above that being driven there is a machine with two drills on extensible booms. This is the roofbolter. (Note that the seam is about 6 ft thick in the model and I have taken away the roof so that you can get an idea of the layout, which is shown from above. In American mines the main method of support is called roof bolting and largely comprises driving large screw-type rods into holes into the roof. A single machine, as shown, will drill the holes normally at about four foot spacing, and then insert these bolts, and tighten them in place squeezing the roof rock together and making it stable enough that men can work beneath it. Generally a heading will go about twenty feet (from the tip of the picks to the cab) before the miner must retract, but some machines are now remotely controlled so that the operator can stand well back as the machine advances. To dilute the gas and sweep it away, large fans will move air through the mine, and stoppings - artificial walls between adjacent pillars - are erected to guide the air so that it sweeps through the working area, and carries the gas and dust away and out of the mine. In the immediate working area these stoppings can be made of cloth or plastic, so that miners can more easily move through them. In the above picture these are shown as being made of heavy yellow plastic strips that the cars can push through easily. When the working area moves on the stoppings are made permanent, and the ones shown are made of grey cinderblocks. Doors are placed in these stoppings at regular intervals to allow men and machines to pass, without much change to the air flow. (But are not shown). Air thus flows up to the working area along the fifth drift, across the face edge cross-cut, and then back out of the mine along the first drift (the one at the top edge of the picture). Remember that in most of this area, all the miners have to see where they are going are the caplamps that they wear on their helmets, or the floodlights on the machines. It is still necessary to leave pillars to hold the roof up. Roads, headings and cross-cuts are often the width or some multiple of the width of the mining machine, ie generally around 12 - 20 ft. depending on the seam depth and the roof rock strength. Pillars may be around 40 ft on each side. It doesn't take long to realize that a lot of coal is being left in the ground. Next tech talk I will talk about the longwall method of getting this out, but the more conventional but more dangerous (though mining is relatively less dangerous these days than a number of other industries) practice of pillar robbing. What this entails is that after the mine reaches the limit of the area that it is working, the continuous miner will start removing coal from the pillars, as the working faces retreat back towards the shaft. Generally the roof is temporarily held up by some additional hydraulic or wooden props as the continuous miner, in one of several patterns, mines through the pillar, and takes out the coal. After a while the roof will collapse into the vacant space, but by this time the workers have usually retreated back and are working in another part of the section. I will describe the other method of mining, more popular in other countries than in the US, in my next tech talk. Earlier lectures have dealt with oilwell drilling and I will return to that topic, and refining, in a couple of weeks. The last oilwell related post was on the subject of gravimetrics, and has, at the back, the list of earlier posts of this type. As usual comments are appreciated, and questions will be answered. How are the miners, cars and other equipment powered? Heavy, stationary/slow-moving equipment is probably electric or electro-hydraulic: electric power has great advantages as long as you don't have to store it. This is doubly true in confined areas. Besides, HO mentioned "power cables", and for these to be big enough to be specifically noted as omitted from a diagram in that scale, they would have to run fairly large loads, i.e. machinery. "It's the dirty little secret that the U.S. government wants to keep hidden from the eyes of America, and the world. There is no better example of a human catastrophe linked to environmental destruction than life in the coal fields of Appalachia." Well, HO once told me (personal communiction) that mountain top removal modified the environment in not necessarily a "bad" way. Needless to say, I disagreed and still do. It was the pollution stuff created after the mining that bothered me most--aside from screwing around with the Appalachians as if we humans were "God". On the other hand, most environments we live in on Earth are human modified now. What is actually "natural" is more and more scarce. And as climate science tells us, we have modified the Earth's atmosphere and oceans irrevocably--at least in any timeframe we care about. Sorry, HO, had to speak to it. Hmmm, I can see that this coal set may well extend for more than the originally planned couple of weekends. Now I also have to go and find some photographs. Yeah - it was at dinner in Denver. I remember his impish grin as defended how Appalachia was much better for getting rid of all those pesky mountains and giving them lots of nice flat useable land. Latent worldwide BTUS in coal almost double oil, nat gas, and wood combined! I need to figure out how to put images in my posts but a 2001 paper entitled "Life-cycle Greenhouse Gas Emissions Inventory for Fischer-Tropsch Fuels" by John Marano and Jared Ciferno shows a graph (in 186 pages) that demonstrates the GHG emissions of CTL are basically double that of conventional oil, all in. Peak Oil, if soon, will be a disaster. Personally, Id rather the hard crash sooner, so future generations can used the stored sunlight in coal for things other than NASCAR and war. Can you say "real estate boom in Alaska'? Some more text commentary here. perhaps this will work. sorry for graphics learning curve. Actually, in the above (successfully..;)linked graph, the combustion component of various fossil fuels vs liquids from coal are all about identical (makes sense). 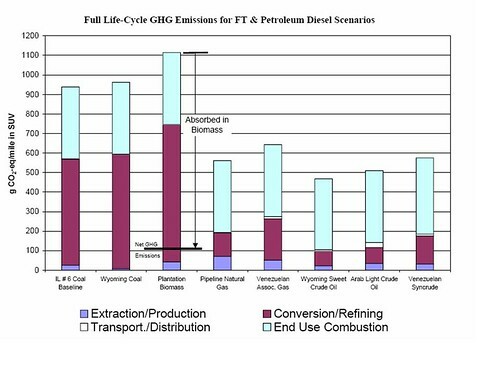 Its just that the refining component for CTL creates much larger GHG (the purple area). As a component of total GHG emissions, CTL looks to be 6 times the amount of marginal GHG than natural gas or crude oil, even though the choice to use fossil fuel liquids itself is much of the GHG equation. Friends, if you are interested in what we can learn about the present state of the coal industry in the wake of the Sago mine disaster, then I recommend the articles of Ken Ward, Jr., in the Charleston Gazette. The Gazette is one of the last family-owned papers in the country and it shows in the relative fearlessness of their coverage. For his latest, see January 15, 2006, 'Chaos' marred critical early hours after blast By Ken Ward Jr. at http://www.wvgazette.com/section/News/2006011415. MSHA has a presentation of the Sago Mine that is posted at their web site. If you go here you can see the mine plan and the sequence of events given as a downloadable Powerpoint or pdf. In response to the question of power for the equipment, it depends on the mine, some equipment is electric powered, with spools of cable on the back of each machine that winds and unwinds as it moves. In some mines diesel equipment is allowed. Oops! Forgot that some shuttle cars can also be battery operated. Yes, we need more discussion about coal as it gradually climbs up to King Coal status again--and drag out the Dickens! Will it be used primarily to make electricity? I can't imagine that CTL will replace gasoline in any meaningful quantity. How about other coal-driven machines? Steam engines? Are modern steam engines more efficient than using electricity from coal? The shame of it is of course global warming, not to mention all the other environmental harm. What a freakin mess it will be. Industry may talk about clean coal, sequestration, etc. but I don't see an energy-starved world sacrificing some energy for such niceties. Are modern steam engines more efficient than using electricity from coal? Unlikely. Almost all coal powerplants are very big steam turbines driving generators. The economies of scale are substantial. High efficiency requires high pressure (over 100 atm is not unusual in large plants) and thus meticulous care in manufacture, operation, and maintenence. Currently, steam plant efficiencies are rather lower than methane-burning combined-cycle gas turbine (e.g. 35% vs. 50%), so much effort is going into high-efficiency clean coal (example). Interestingly enough, quite a few steam-powered automobiles were built (some have been maintained in working order to this day). Most of them, especially the later ones, used fuel oil or kerosene which were much easier to handle than coal. If we ever get to a point where this is no longer an issue due to costs, there will likely be relatively few people for whom personal cars remain a serious option for transport. Basic question, but once Coal is converted to liquid fuel via Fischer-Tropshc, is it than capable of being used IDENTICALLY to the way oil is today? In other words, environmental concerns aside, is it truly fungible, or are there a few charactersitics that would preclude certain uses? If you're talking diesel oil, the answer is yes. To get gasoline, you need further processing and blending. Current state-of-the-art supercritical steam power generation plant operate at up to 300bar and 600ºC, with net efficiencies, firing coal, of around 45% (lower heating value, LHV, basis) depending on coal type and plant location. Much work has been carried out over the last 20 years to develop new steels for these plant, both for the boiler and the steam turbine. A number of new steels are currently being tested which could allow steam temperatures up to 650ºC; nickel (Ni)-based alloys are under consideration for higher temperatures. I was just recently looking at some EIA data on coal and became curious about the increase in production of sub-bituminous coal and lignite vs. bituminous and anthracite (negligible nowadays). The basic information is available at http://www.eia.doe.gov/emeu/aer/pdf/pages/sec7_6.pdf . If one makes a quick plot of not just production, but of energy per ton as a function of time, taking into account the change in grade of coal being mined, it becomes evident that the energy efficiency of coal has dropped by about 20% since 1970. That is, the energy content of a ton of coal has dropped from 25 MMBtu to 20 MMBtu, averaged over all production. Furthermore, and I am not sure how significant this is, the productivity of mining has been flat or dropping for the past five years, as measured in short tons of coal produced per miner-hour. The drop in the BTU content is a function of coal shifting westward to the Powder River Basin of Wyoming in the late 70's. Now a third of the nations coal comes from there. Productivity has declined in surface mines mainly due to increases in stripping ratios as the mines are forced to dig to greater depths. Even a few years ago when I worked in the basin there were still areas of 1:1 ratio coal, that is now a thing of the past where ratio's are up above 4:1.